Posted: Thursday 14th March 2013 in Paid Media, Thought Leadership. Some breaking news from Google. 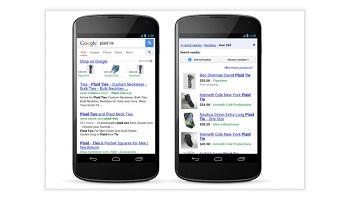 Product Listing Ads are now eligible to appear on Smartphones. You need to have upgraded your PLA campaigns to enhanced campaigns to take advantage of this. There is a Webinar today at 5pm discussing these changes, which Adam Chard will summarise in a blog tomorrow. This would appear a great opportunity to increase coverage to mobile devices, where the user journey may begin, e.g. comparing prices whilst in-store.